Viewing President Donald Trump’s action to quit a major weapons treaty with Russia as lawless and perilous, activists have been seeking congressional action to preserve the treaty. On grounds of Russian violations, Trump decided to withdraw the nation from the Intermediate-range Nuclear Forces Treaty (INF). It permits a “party” to withdraw six months after giving notice. In 1987, 93 members of the Senate approved the treaty, submitted by President Ronald Reagan. (Only five senators opposed it.) Trump presumes that he alone can terminate it. On February 1, Secretary of State Mike Pompeo announced that the United States was “suspending” the treaty, effective the following day. He gave Russia six months to return to compliance. He did not make it clear what the U.S. would do in the meantime. If that was the official notice, and if one accepts the concept of Trump alone being a “party” to the treaty, it would apparently permit the withdrawal on August 1. The treaty says nothing about a party “suspending” it. (1) A president alone cannot lawfully repeal a treaty — or any other law. 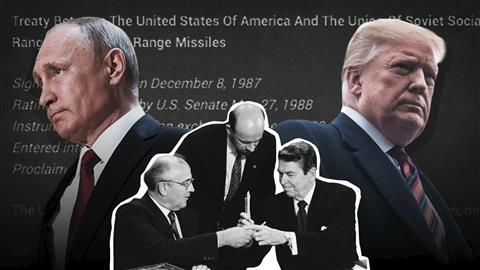 (2) Unless a majority of each house of Congress or two-thirds of the Senate votes to undo it, the INF Treaty remains in effect. Click either HR or S to see the desired document (in PDF format). Print it if you wish. You might ask your representative to introduce the measure. Send the document to him or her, or else let the member of Congress know it’s on http://www.warandlaw.org. The same for either or both of your senators. WALL has just reissued its paper “Termination of Treaties” from 2002. With a new foreword, it shows why the president's action is autocratic and unconstitutional — let alone perilous for the world. The War and Law League’s Legislative Committee drew up the proposed resolution (see right sidebar) in two similar versions: one for the House of Representatives and one for the Senate. The measure would not be subject to presidential veto. A new nuclear arms race — risking a war with Russia that destroys mankind — will probably be the outcome of Donald Trump’s exit from INF. Two credible sources for that statement, published in the Washington Post last December, are Mikhail Gorbachev, Russian ex-president, and George P. Shultz, secretary of state under President Reagan. They participated in negotiations for INF, which Gorbachev and Reagan signed in December 1987. Warning of those dire consequences, they urged continuing the pact, confident that differences could be ironed out through diplomatic and military meetings between Russia and the U.S. Both sides have alleged treaty breaches. The Trump administration considers a certain Russian missile in violation. Putin’s government sees a violation in U.S. deployment of certain systems in Europe. Yet INF has been successful. It prohibited both nuclear and conventional missiles (plus their launchers, devices to initially guide them) with ranges between about 300 and 3,400 miles. Russia and the USA conducted mutual inspections and scrapped nearly 2,700 missiles, which could have sent some 4,000 nuclear warheads to kill millions of people. A treaty must get the consent of at least two-thirds of the Senate to go into effect. Many authorities have pointed out that a treaty is a law. A president cannot repeal a statute on his own (an argument goes); so how could he presume to repeal a treaty on his own? The Constitution mentions neither type of repeal, but it’s unlikely that a president could get away with the former. James Madison, the fourth U.S. president, sometimes called “Father of the Constitution,” saw the need for “the same authority precisely being exercised in annulling as in making a treaty.” Presidents Grant, Hayes, and Taft (later as chief justice) recognized the need for some type of congressional action to undo a treaty. Seven federal judges took that view, though not decisively. In Goldwater v. Carter, the senator challenged President Carter’s notification of termination of a treaty with Taiwan. DC District Judge Oliver Gasch ruled in 1979 that prior congressional action was required, either (1) a majority of both houses or (2) two-thirds of the Senate. He wrote that the repeal of a treaty — a law of the land — by the executive alone raised the same fears of unchecked power that prompted the Founding Fathers to require Senate participation to enact a treaty. In 2002 when George W. Bush knifed the ABM Limitation treaty of 1972 and 33 representatives challenged him in Kucinich v. Bush, DC District Judge John Bates ducked the issue in 2002, just as the Supreme Court had done 23 years before. He called it a “political question” and found that anyway the members of Congress lacked standing to sue. No one appealed. Three measures related to nuclear weapons have been introduced in Congress lately. Securing the Republican support needed to get any of them through the Senate would be a formidable task. On November 28, Senator Jeff Merkley (D-OR), with five cosponsors, introduced S. 3667, the “Prevention of Arms Race Act of 2018.” It would prohibit procurement or deployment of missiles covered under INF until the secretary of defense reported that certain conditions were met. It objects to Trump’s quitting of INF without “consultation” with Congress. In January, Rep. Ted Lieu (D-CA) and Senator Ed Markey (D-MA) renewed legislation that they had introduced two years earlier, to prohibit a president from launching a nuclear first strike without a congressional declaration of war that expressly authorized such a strike. They call it the “Restricting First Use of Nuclear Weapons Act of 2019.” The House version drew 81 cosponsors the first time. The Defense Appropriations Act for fiscal 2019, signed into law September 28, contains a nonbinding provision to encourage (but not require) the administration to “suspend” INF and work on new weapons. It compares to a provision in the fiscal 2016 act, encouraging the Pentagon to study “counterforce capabilities” of intermediate missiles, whether they conformed to INF or not. In late November, Roots Action (a liberal activist outfit of Sacramento, Calif.) tried to get Congress to preserve INF and refuse to fund weapons prohibited by the treaty. People sent over 30,00 e-mails to their members of Congress through the group’s system. The Republican Congress did not budge. In January, Democrats took over the House of Representatives, affording measures that oppose the Republican president’s policies a better chance.